Here it is Friday. The end of another standard work week and just mere hours away from the little bit of freedom that is the weekend. Thank goodness. There are many days that I wish art and painting was my full time job. Most days in fact. I would imagine most people would love to be able to support themselves with a job that they love. For most people though I don't think that ever happens but that's ok.
For years now I have supported myself with a good ol' 9-5 desk job and I really can't complain too much. I sit safely tucked away from whatever the weather decides to do in a temperature controlled office within a few feet of the office kitchen and bathroom. My weekly days are filled with data entry, emails and answering phones with my unnaturally chipper "receptionist voice". It all gets very old very fast and feels a little soul sucking. I think all of that is what makes art that much more important to me right now. After a bothersome day or at the end of a difficult week in my 9-5 life all can be, at the very least, temporarily forgotten if I have the chance to sit down my paints or go exploring with my camera. I suppose a glass of wine can help with that as well. Art is a way for me to shake off the frustration or unleash pent up creative energy that inevitably builds up through the doldrums of the work week. I know I can look back at old paintings and recognize the mood I was in at the time and how it shows up on the canvas. 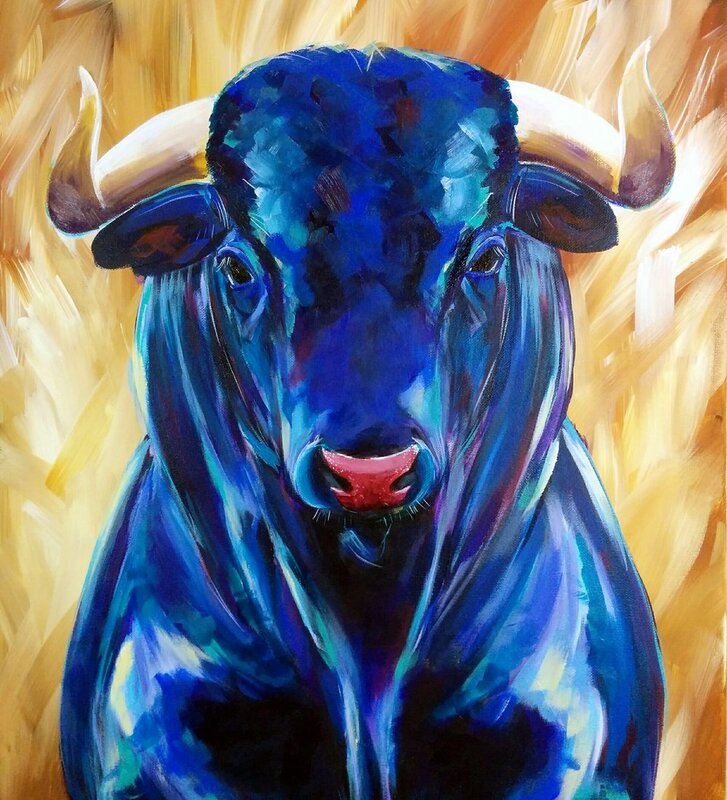 Vincent the Bull is part of a bovine series of several colorful cow & bull paintings. The day I started working on Vincent's painting I was particularly cranky and I think it shows. While I think Vincent is just as colorful as the rest of the cows, it has a slightly different mood about it compared to the others. A bit more confrontational in his gaze. Chauncey the Llama, on the other hand, came about a few days before I was to participate in a local art festival with my gallery. This was my first time bringing my art to an event like this and I was excited to create something new for it. That excitement coupled with a new found love for llamas, Chauncey the utterly fabulous llama was created. And when I look back at it I can see the fun and excitement I felt while painting. I hope that one day I am lucky enough to be able to make my art my career. I also hope that if art becomes my daily work it still has the power to clear out my dusty soul.